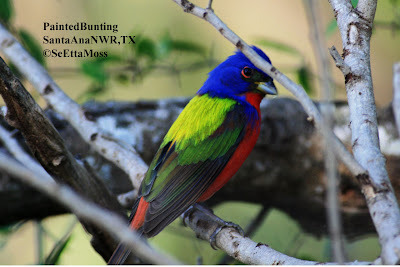 Today I birded again at Quinta Mazatlan World Birding Center in McAllen,TX. The weather really sucked--the winds were gusting up to 35 mph, the humidity was awful and it got to 96 degrees in McAllen and was that temperature when I returned later this afternoon. I almost never wear shorts when birding but it was so bad this afternoon I couldn't bear to put on long pants. 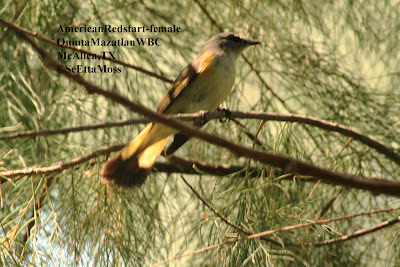 I found the female but a McAllen resident who used to be on the board of Quinta Mazatlan told me about the male. They were both in the same area near the golf course. Both redstarts were actively foraging. 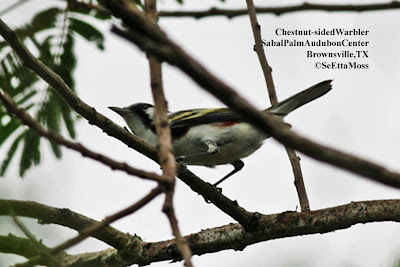 The female stayed up in the trees but the male bird did go down on the ground by a small pond as shown in the bottom 3 pics. 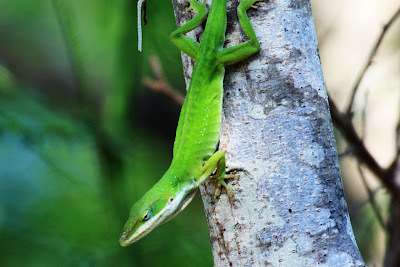 Besides all the cool birds at the So Padre Island Migratory Bird Sanctuary, I also saw two lizard species including this brilliantly colored lime green lizard. Unfortunately I'm not skilled at lizard identification so I'm hopeful that someone will let me know what species it is. SeEtta I got an email letting me know that this is a Green Anole, Anolis carolinensis. 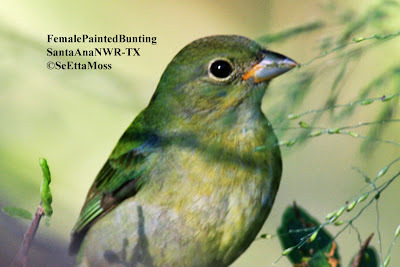 Thanks to Joshua Rose, Ph.D., a Natural Resource Specialist at Bentsen-Rio Grande Valley State Park. Joshua is a great resource on birds, butterflies, insects, reptiles and probably more. 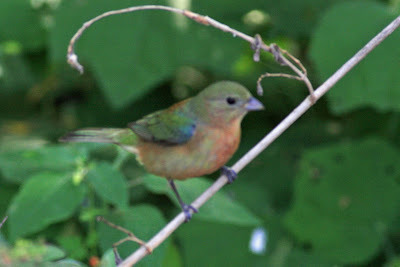 This female Painted Bunting was foraging in the same location as the male pictured in the post below. Though her plumage is not as brilliant as that of the male, she was still quite colorful with her bright greenish feathers. She was less reticent than the male so I got to watch her for several minutes and got several pics. 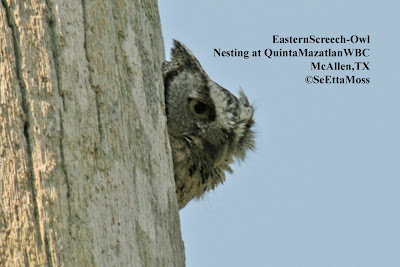 A few blue feathers on the shoulder area and a few around the head area show up in several pics. Birds of North America online states that females in Basic I plumage may have blue feathers on their heads. As I walked on the "wetland bridge" walkway over the currently dry marsh area, I heard a song I with which I was unfamiliar. 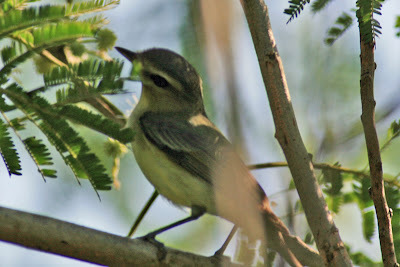 I was surprised when I found that the Common Yellowthroat in these pics was giving that song. It's song sounded nothing like the wich-e-ty, wich-e-ty, wich-e-ty that is associated with this species. 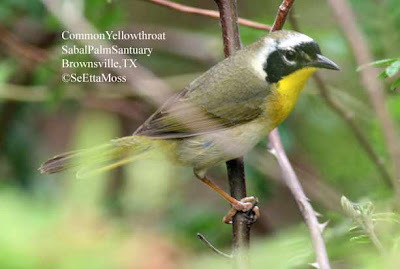 I was told today that there is a subspecies called the "Brownsville Yellowthroat" that has a very different song. I found some brief information about this subspecies, Geothlypis trichas insperata, but I couldn't find a recording of its' song to listen to. 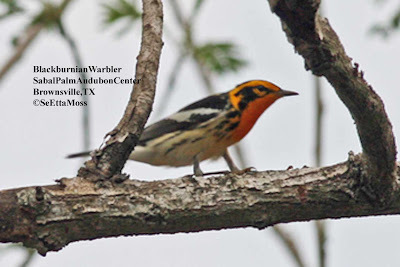 Brilliant,brilliant,brilliant--that is the most descriptive word for male Blackburnian Warblers. Their orange heads are so very bright and intense.